The Harsey Difensa series is developed by Spartan Blades and created by renowned blade expert William Harsey, Jr. 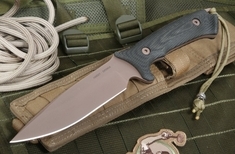 The 6.25" fixed blade is made from Stainless CPM S-35VN Steel. It is covered in a special SpartaCoat of PVD Zirconium Nitrate, which keeps the knife durable through any situation. 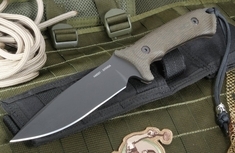 The blade can come in either black or flat dark earth (FDE). This 11.675" knife weighs 11.4 oz. and is 3/16" thick. The handle, made from 3D Machined Canvas Micarta, has the perfect grip and comes in either black or green. Overall, this knife is durable and can be used in a variety of jobs.